Last week we spent time beta testing the new Demigods internally. We couldn’t have released them externally even if we wanted because all the IT resources were consumed by the Impulse release of Dragon Age: Origins (a totally awesome game btw). Despite some sensationalist EA-bashing I read online, the launch of the game was pretty smooth outside some hicups with the free DLC that EA gave away which had been resolved within 24 hours. If you ever wondered what a Baldur’s Gate – in spirit – game would be like if made today, BioWare has delivered it. It’s really that good. Anyway, enough plugging. Besides, I’m bitter that my schedule is so tight that I don’t get to play it as much as I want – for now. SO WHERE ARE THE DEMIGODS?! So how are the new Demigods finally going to get distributed? Assuming all goes well with QA, this Wednesday, we expect to release v1.2. This isn’t a promise, this depends on QA. 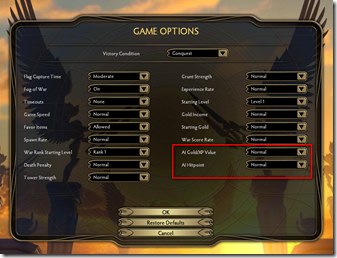 Game options can now set what happens with AI Players. 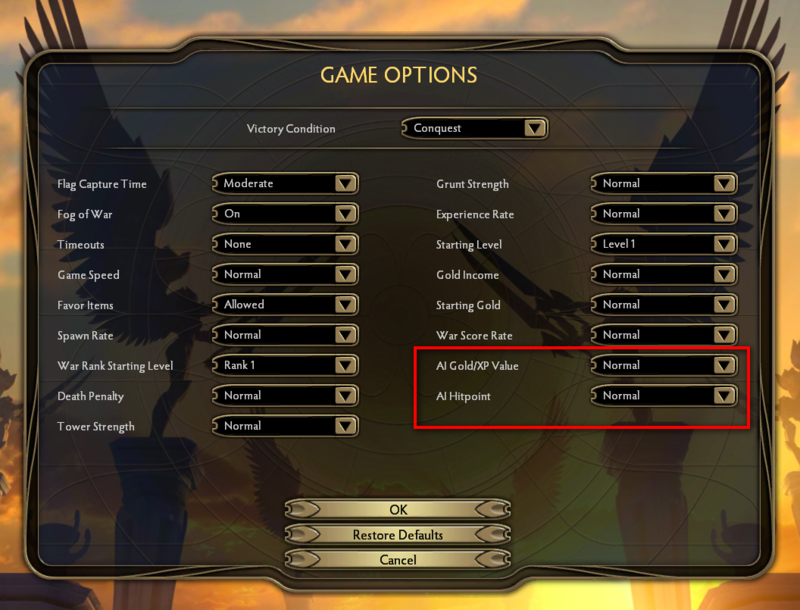 THIS IS A BIG DEAL for those of us who play online because AND in skirmish because you can now control how tough the AI Players are and what they give you when they die. So in MP, someone drops, you have an AI Player you can now make it so that they don’t give much gold and toughen them up or some combination. 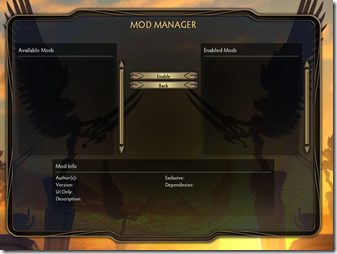 Players can make mods and share them with others. 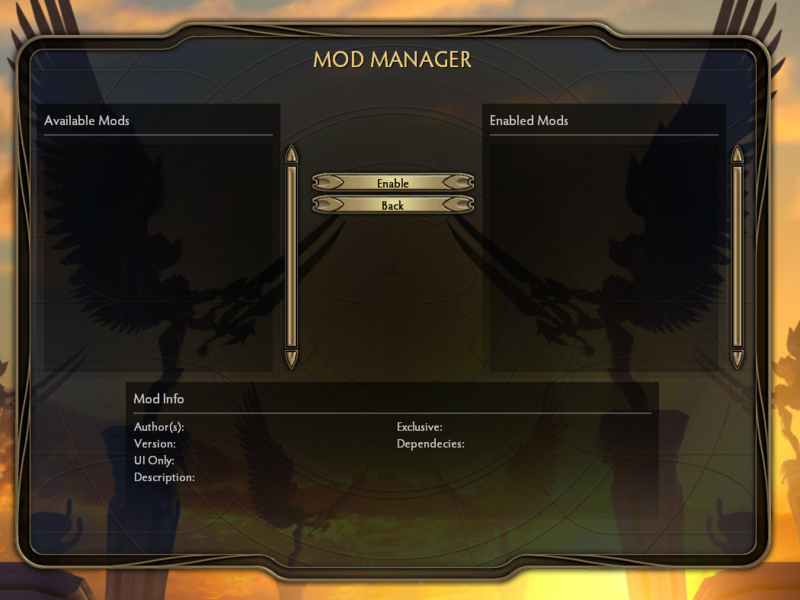 You can enable mods and if everyone else has those mods, voila they’re on like game options. If someone has mods enabled and a user doesn’t have it, they can’t join the game. This is for security purposes – these ARE mods afterall made potentially by third parties. We plan to get some mods out there as soon as possible so people can see what’s possible. When I get time, I want to try to make “Brad’s Item Pack” which adds new items to the game. Queen of Thorns. I hope to have some good news on this this week. AI improvements. I’ll get more specifics. Online play. We’ve requested changes to make MP smoother on “laggy” connections. That said, the best thing you guys can do is make sure “stuff” isn’t being downloaded in the background. Every time we investigate specific cases it turns out someone has Windows update downloading stuff on another machine in their house, has bit torrent going on or is streaming something via their Xbox or Play Station. Basically, Ping tells you response time but it doesn’t tell you whether something else is eating your bandwidth. High End Favor Items. We’re discussing new high end favor items. They won’t be in this week but the idea is to have things beyond “blood of the fallen” and such that are simply better but cost more. Once the updated version of Demigod is out, I will start talking to people via Ready to Play. At first, I’ll just be playing with people and I’ll have the Demigod. Other Stardockians will be playing as well this way. Then we’ll start adding the new demigods to people’s accounts and they’ll be playing it. From there, we’ll get more feedback and submit that to GPG to tweak the demigods further and then everyone will get them in a follow-up to v1.2.